Over the past couple of years, Walt Disney World has become pros at cycling favorite dishes on and off of menus, refreshing stale bill o’ fares, and branching out into new directions that, for a Disney quick service location, may seem adventurous. However, many of the results have been scrumptious to partake in, some of which even made me giddy just to think about beforehand. 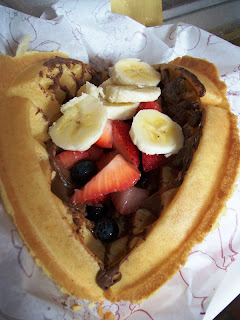 One such food dream I’ve had in recent months were the waffle sandwiches from Sleepy Hollow Refreshments. 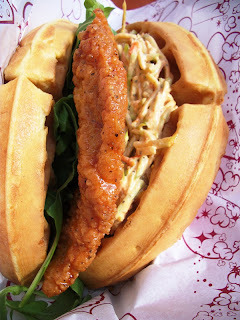 Sweet and Spicy Chicken – Chicken and waffles in Walt Disney World?!?! In a word, awesome! The chicken could use a bit more kick, but the sweet and savory interplay here is great. The waffle sops up the juices and condiments while retaining its crustiness and eluding the soggy nature found so often in chicken sandwiches of this sort. 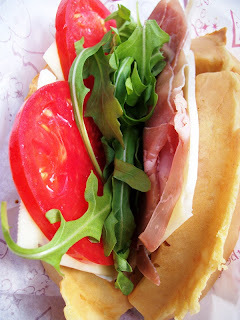 Ham, Prosciutto and Swiss – Of the three waffle sandwiches, this was the only one that disappointed me. With such hunky waffles, there is not enough filling to offset the bread. Additionally, the Swiss cheese overpowers the other elements of the sandwich. Nutella and Fresh Fruit – This would not be my recommendation for lunch or dinner, although it would definitely fill you up! What could be assumed to be too sweet, actually has a great combination of flavors. This waffle sandwich is perfect for breakfast or a snack, especially if you are going to split the snack with someone else. All in all, the waffle sandwiches of Sleepy Hollow Refreshments are a nice change from the hamburger, nuggets, and hot dogs that are the standard menu bearers around the Magic Kingdom. While some could still use a few tweaks, the sweet, hot and crispiness of the folded waffles pair well with the sweet and the savory components stuffed into them. Don’t take my word for it, go on out and get yourself one!